Above is the published InsertionLoss. 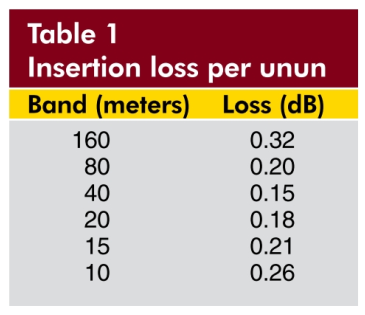 The article states that they were half the value obtained in a back to back measurement, and it should be noted that is a compromised measurement, and secondly that InsertionLoss comprises two components, (dissipative) Loss and MismatchLoss. The fact that InsertionLoss increases markedly at the lower frequencies is a hint that it has too few turns for those frequencies, and that InsertionVSWR and efficiency may suffer. 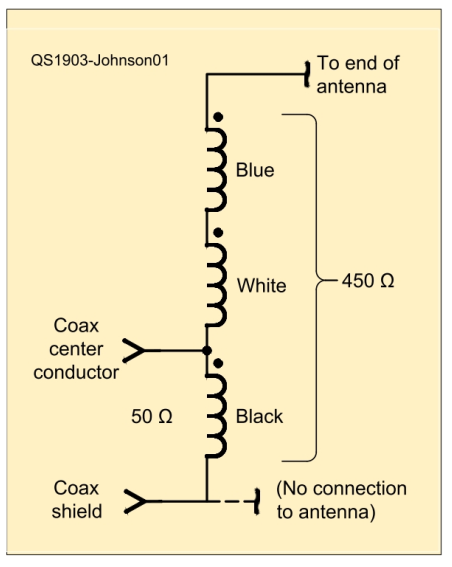 Analysis of a simple model of the transformer with a load such that input impedance is 50+j0Ω gives insight into likely core losses in that matched condition. 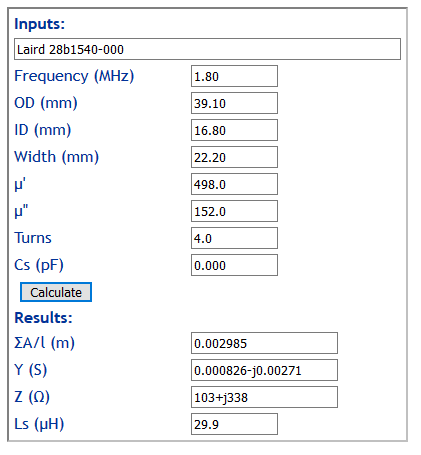 Let us calculate the magnetising admittance of the 4t primary at 1.8MHz. The core is a Laird 28B1540-000 ferrite toroid. 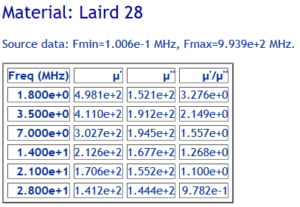 Above is a table of complex permeability for Laird 28 material. (I have seen online experts advise that this information is not available… but here it is.) 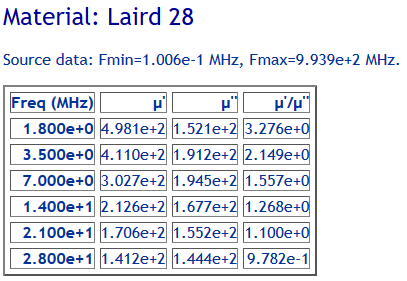 The Laird #28 material is a medium μ NiZn ferrite, somewhat similar to Fair-rite #43 but different enough to not be equivalent. 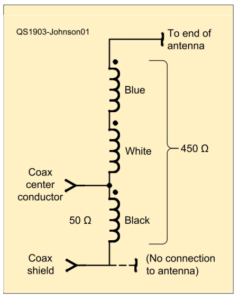 Now lets model the 4t primary at 1.8MHz. Gcore is the real part of Y, 0.000826S. If Yin of the loaded transformer is 0.02S, we can calculate the core efficiency as 1-Gcore/Gin=1-0.000826/0.02=95.8%, core loss is 0.18dB. Note that this efficiency is in the matched condition, and could be higher or lower at other input impedances (η=1-Gcore/Gin). Ferrite materials have fairly wide tolerance, so measurements of actual cores may have some variation. The balance of the measured InsertionLoss is likely to be MismatchLoss, but that information is not disclosed in the main article. MismatchLoss will include contributions from the shunt magnetising admittance (moderately low in this case) and effects of flux leakage. ———. 2006. A method for estimating the impedance of a ferrite cored toroidal inductor at RF. VK1OD.net (offline).